Dell, the well known manufacturer of personal computers, has been quietly acquiring companies and building a division capable of offering a complete range of services and products geared towards helping retailers be competitive in the 21st century. Visitors to the Dell.com/retail page will be impressed by the wide variety of solutions that Dell is providing to meet the needs of retailers. Having been a Dell customer for years, I’ve been watching more and more retail products and services appear in its catalogs over the last two decades. 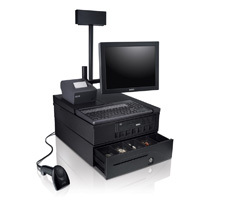 Point of sale systems and equipment designed to meet the demands of rigorous retail environments. Installing computers that are designed and hardened for retail is a smart business decision, as these machines are often used 12 to 24 hours a day, in dusty, hot areas. Dell’s OptiPlex XE, for example, is designed to run in enclosed spaces, at ambient temperatures of up to 45°C (113°F) and up to 55°C (131°F) with the optional ducting kit. To round out its retail product line, Dell has partnered with peripheral providers like APG Cash Drawer, Epson receipt printers, Cherry Keyboards and Logic Controls. Digital Signage – Dell’s division has over 10 years of experience installing digital signage solutions which offer dynamic content delivery. Benefits of digital signage include being able to promote upsells and impulse purchases, modernizing the appearance of your business locations, creating highly targeted promotions and messaging on demand, automatically updating the signage based on sales results, inventory levels or in-store locations. Additionally, content can be controlled from headquarters and thousands of monitors can be updated simultaneously. Digital Surveillance – which also includes solutions for traffic counting, monitoring and visual notification and verification of unusual transactions like Voids, and no-sales. SecureWorks – handles PCI compliance for retailers as well as vulnerability assessments, security information management, log monitoring and management, threat intelligence, security and risk consulting. Boomi – a cloud product that integrates data from disparate applications to provide a centralized data source for business information and analytics. Can combine data from such as Microsoft Dynamics, Intuit Quickbooks, Salesforce to produce integrated views of company activity. Will Atkinson of CAP Retail , – “For CAP, Dell brings a strong and experienced platform to enable our software products. Their dedicated sales and support structure is helping us reach a new customer set. As a household name name from their PC division, Dell is helping us bring POS to customers in a fresh way.” CAP Retail is a Dell ISV Alliance Partner. With all of the investment that Dell has made into the retail space, they are sure to be a key retail industry player for a long time to come.